The Popular New-age Film "3 Magic Words" Suggests There Exists a Heightened Perception Beyond and Above Our Surface Personality Mind as in the Book, "Three Magic Words"
The movie, "3 Magic Words" attempts to bridge science and spirituality as it describes a new revolution in consciousness and a unity with all things. It depicts a very old wisdom that there is an enormous sea of consciousness, pervading all, supporting all, and individual consciousness grows out of it. When I discovered the book ‘Three Magic Words’, I immediately knew that I had found a real answer to the many questions I had about life. What if you lost your memory and had to look deep within yourself to find the answer to life's biggest question, "Who am I"? Using science, nature and spirituality, a film called 3 Magic Words comes up with a response that is having people look at life from an entirely new perspective. The feature-length documentary which has just been released as a DVD for sale in North America, assembles extraordinary and vibrant men and women including Neale Donald Walsch, Gary Renard, Debbie Ford, Gudni Gudnason, Delores Cannon, Kute Blackson, and Theresa Ibis among others and shares their enlightening revelations. Largely inspired by the book “Three Magic Words” by Uell Stanley Andersen (1917- 1986) widely known as U.S. Andersen, which is a series of essays originally published in 1954 aimed at revealing human being’s power over all things. Andersen writes that there is only one mover in all creation and that mover is thought. Perlin’s company Starseed Films is a Metaphysical Film company based in Southern California. Its mission is to create inspiring films that inspire and enlighten the human spirit and bring us closer to unity consciousness. Starseed Films is dedicated to the unity of all people regardless of race, religion, or nationality and towards that end is translating 3 Magic Words into every major language and truly bringing it to the world. Beyond the original version in English, subtitles or translations of the DVD are currently available in Arabic, Croatian, Chinese, French, German, Hungarian, Japanese, Norwegian, Portuguese, Romanian, Russian, Spanish, Filipino, and Tamil with many other languages available soon. 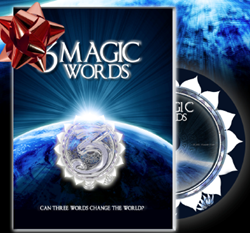 Starseed Films is also donating 3 Magic Words DVDs to police stations, correctional facilities, drug rehabilitation and juvenile detention centers nationwide for free as a healing resource. For more information about 3 Magic Words, to view a trailer of the film and/or learn more about the story behind this provocative and timely film go to: http://www.3MagicWordsMovie.com.